Our hotel was located right across from Andrew’s Air Force Base which I somehow didn’t realize when booking the room. Luckily I must say it was a very quiet area and there were no loud airplane noises during the night. We woke up and headed to an IHOP for breakfast before taking a 15 minutes drive into downtown Washington, DC for day 2. I picked a parking lot close to the center of our tour for the day so that it was within walking distance should we need to end the trip early for any reason (ie grumpy/tired daughter). We took a short walk over to the White House and maneuvered our way through a variety of people protesting whatever conspiracy theory they believed was currently taking place. You can see by the picture below this was about as close as we could get. With the White House off our bucket list we started walking down Pennsylvania Avenue. Our next stop was the Washington Welcome Center which is a large souvenir store that also has a tour bus service. I already had our day planned out so we didn’t do the bus tour but it does seem like a great way to see all the popular sites in a quick amount of time. 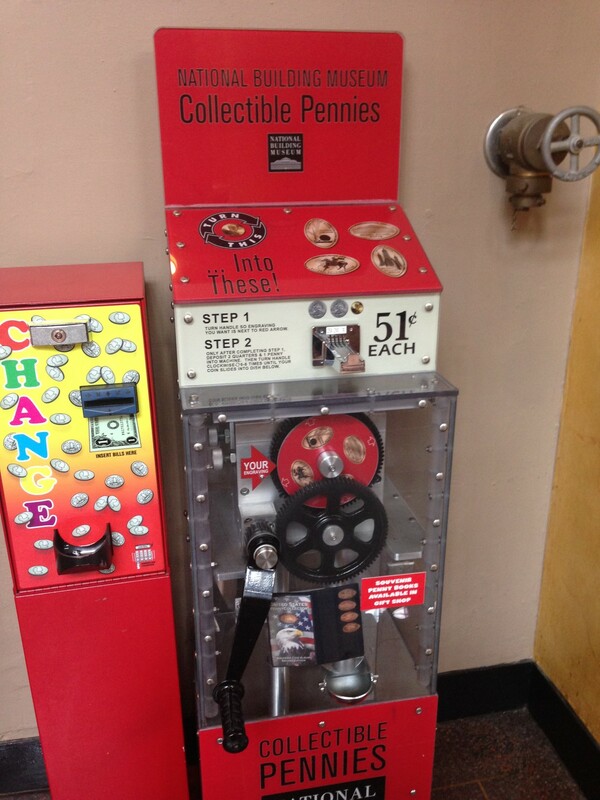 My wife and Hanna started looking around the store as I came across the penny machine located here. 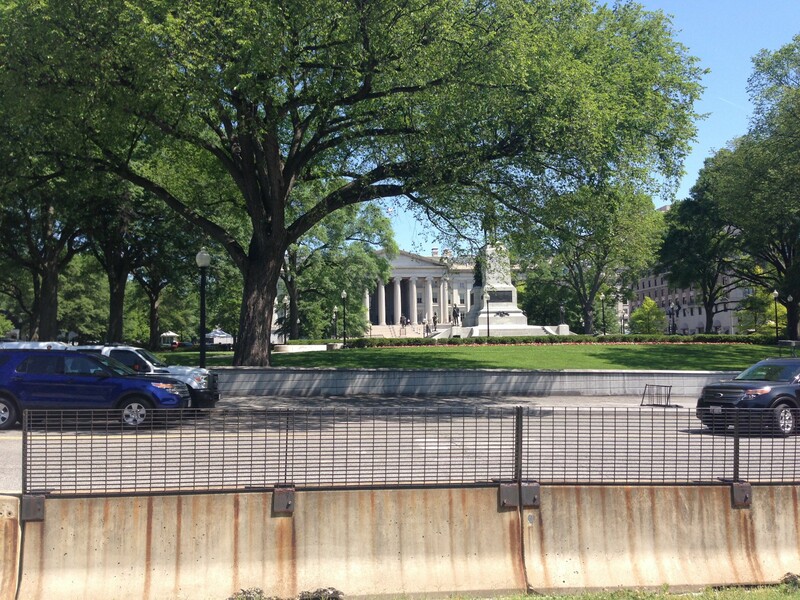 The designs included: The Jefferson Memorial, Lincoln Memorial, Trolley Tours and the Washington Monument. While I was using it I did have a couple of people come up and ask about it. 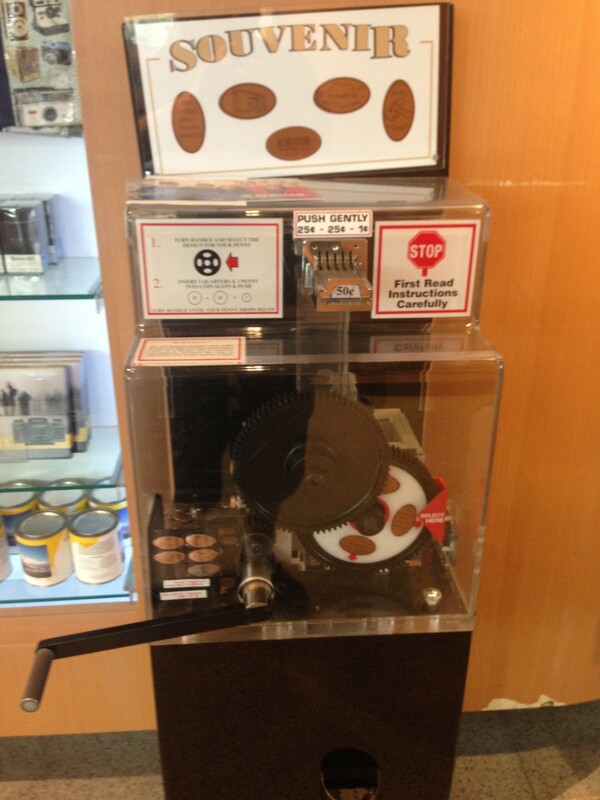 This is a common thing that if you become a pressed penny collector you will run into and should try to encourage. It’s a great way to meet new people and help keep the hobby going strong. We left the store and walked up the street passed Ford’s Theatre (we were coming back to this shortly). 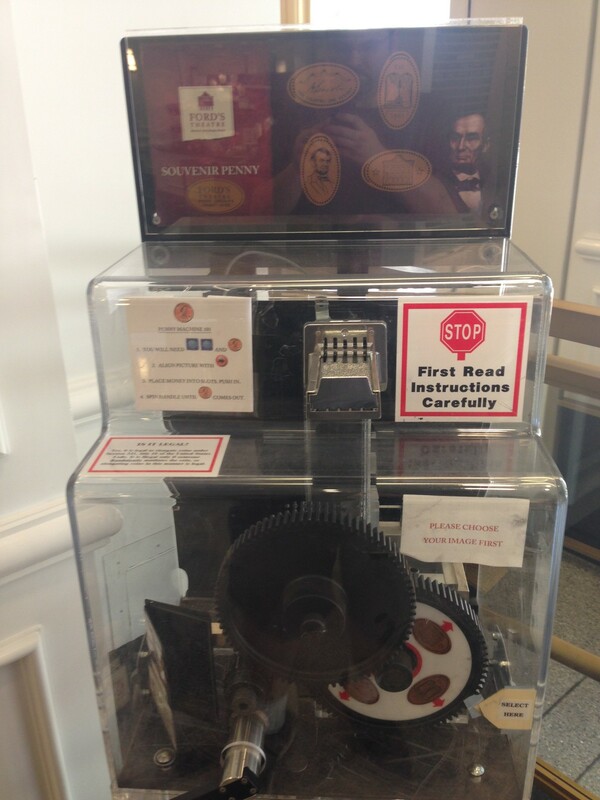 There was another store called Honest Abe’s souvenirs which I ran into and pressed the next batch of pennies. My wife stayed outside with Hanna who was more interested in having a quick snack. The designs of this machine were: Abraham Lincoln, the Lincoln Memorial, Jefferson Memorial and Ford’s Theatre. For some reason this place was incredibly packed so I squeezed my way back outside and joined back up with my family. Moving across the street we paid admission to see Madam Tussaud’s celebrity wax museum. These usually freak me out as I always think one is going to come alive (watch the horror moving House of Wax if you don’t believe me). We walked through the exhibits which were really well done. This location really focused on American history so it included sculptures of all the Presidents, and other Washington, DC celebrities. The museum ended with a snack bar and gift shop which also housed a penny machine. See how dedicated a collector I am? 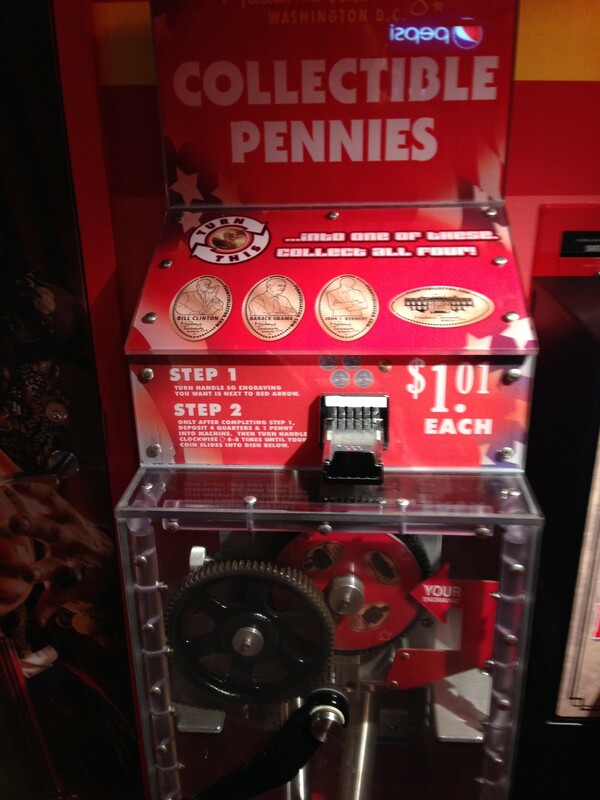 I risked going through a freaky wax museum just to get some pressed pennies. Just like the wax figures in the museum these pennies focused on American Presidents. The designs included Bill Clinton, John F. Kennedy, Barack Obama and the White House all including the Madame Tussaud’s’ logo and location. The people working in the wax museum were very nice and thanked us for coming. We left and walked back the way we had originally came so we could visit Ford’s Theatre. Tour tickets were free but you had to wait in line as they only allow groups of people in periodically to help keep the crowds inside manageable. We only had to wait about 15 minutes before we were allowed to enter. Since we had Hanna’s carriage with us we were allowed to skip the line and use the elevator instead of the stairs. We checked out the museum first which displays the pistol and bullet that shot President Lincoln. There were other exhibits listing the details and timeline of events that occurred leading up to the assassination. Very interesting, but at the same time very morbid and almost seemed inappropriate to be gawking over all these items. The museum was starting to fill up with the next group of visitors so we headed back to the elevator and headed to the actual theatre balcony. 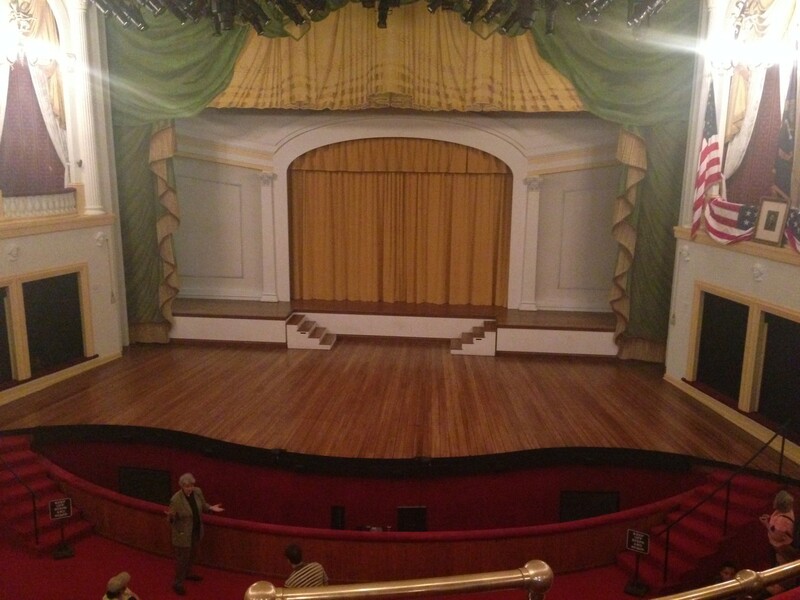 We sat in the balcony and listened to a tour guide describe the history of the theatre. By this time Hanna had fallen asleep in her carriage so we decided to skip the rest of the tour and head out. Before leaving the theatre we did pass the gift shop that had a penny machine. I pressed the pennies and met them outside before we were off to the next location. Hanna continued to sleep as we walked a few blocks over to the American Art Museum. Admission was free and they have an amazing collection. I’ve always been a big Edward Hopper fan so I used the museum’s app on my phone to look up the artist and the app let me know there were a couple of his paintings on display and even gave directions on where to find them. We walked over did the obligatory art stare as we tried to make it look like we were artsy folk. To be honest I know very little about art, but just really like his paintings and style that’s it. I try not to pretend I know anymore about it. There was a part of the museum setup almost like a library or lounge with lots of seating and desks you could stay and work or relax at. 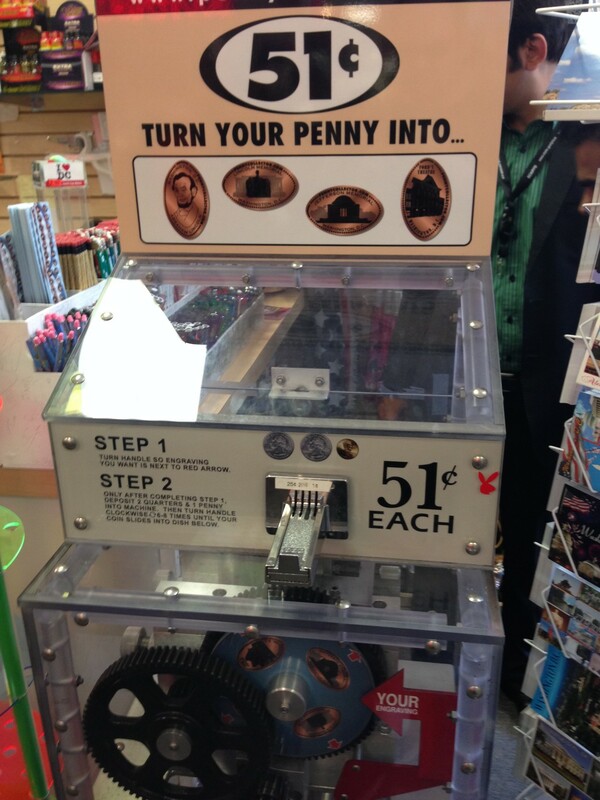 In this area there was a penny machine with 4 designs. I pressed them and we continued our tour of the museum. With our art quota filled for the day we headed back outside and walked a few more blocks until we came to the National Building Museum. This museum is dedicated to just that, buildings. But also to architecture and structural design which makes it very interested. 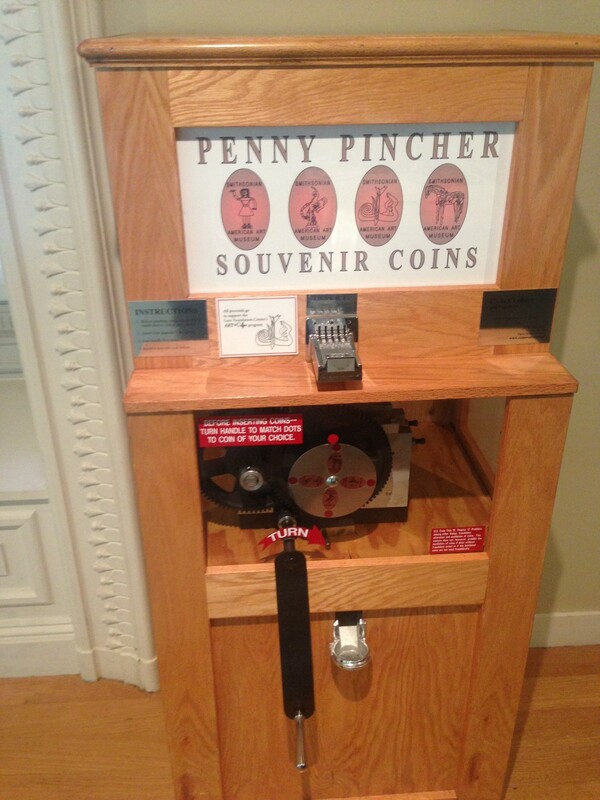 There is an admission fee to view this museum, but we were just there to pressed some pennies and the machine was located outside the gift shop which was free to access. The main floor was one huge room with a water fountain in the middle. Hanna was awake by this time and wanted to stretch her legs so she took this opportunity to run around like a maniac. Each penny design included famous buildings from around the US. They pressed very nicely and the machine even had an attached change machine which I hadn’t seen too many of so far on this trip. I always come prepared with additional change and pennies but it was nice to see these change machines from time to time in case extra is needed. We stopped for a quick bite to eat and then headed to the last location for the day. It was a place called the Newseum. This place was dedicated to the media in all forms, print, radio, and TV. We starting going through the exhibits but by this time Hanna was ready for the day to end. My wife kept Hanna occupied while I raced to find the two penny machines and do what needed to be done. Both machines had 4 designs each. The first machines has the Newseum building, News Hound, Freedom, and Not tonight dear I’m on a deadline pennies. The second machine designs were a Microphone, Camera, Typewriter and another News Hound. 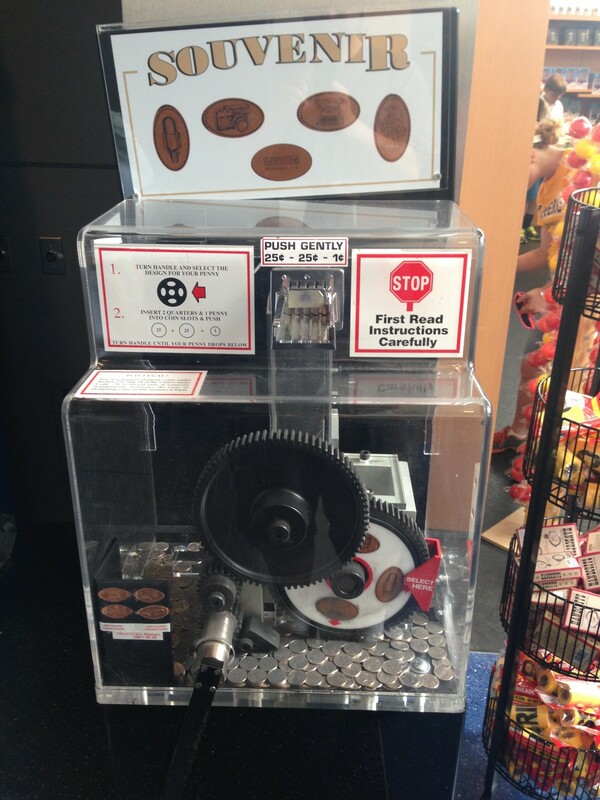 These machines didn’t roll very smoothly and the pennies came out a little short but designs still came out fine. Leaving the Newseum we walked a few blocks back to where we had started and found our car in the parking garage exactly where we had left it (that’s always good). We headed back to the hotel to relax before ordering in some food for dinner. It was a great day, very busy and we saw lots of places and even feel more knowledgeable about some American history. Let’s get some rest for tomorrow is another busy day. 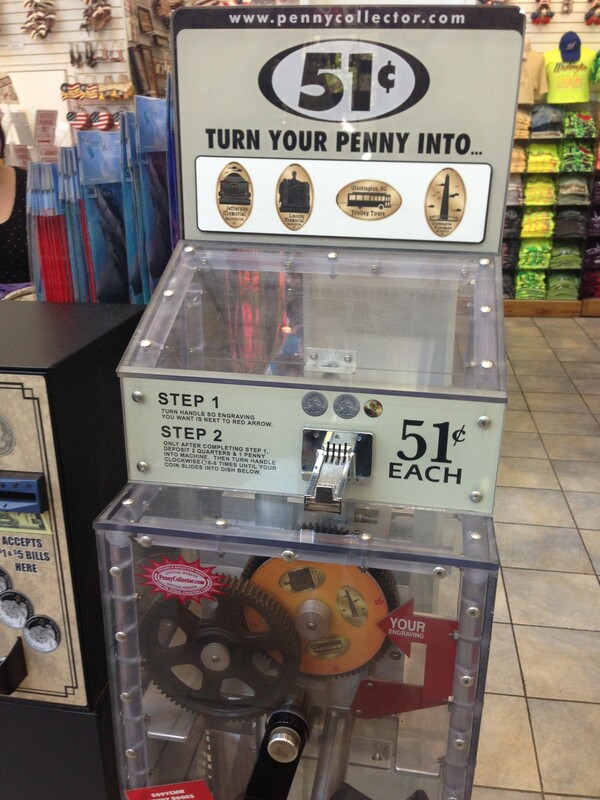 I can hear those pennies calling my name.